You didn’t miss the blog post “Montana Days Off – Week 1” – It didn’t exist! We worked our last 5 days at Farragut, had two long driving days to get here and then worked the first 6 days here. Whew! We thought we were retired….. It was really nice to have some days off! 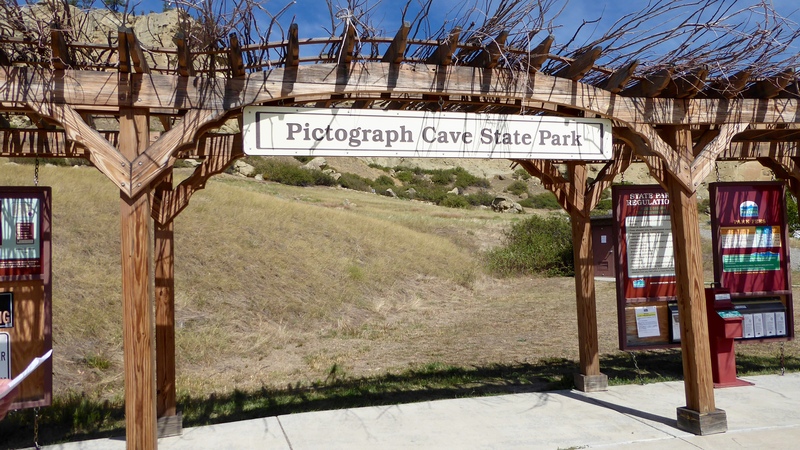 First stop – Pictograph Cave State Park. The cave is in an area along the Yellowstone River where many peoples have traveled over time. The cave was excavated in 1937 and over 30,000 artifacts were found, some over 9000 years old. 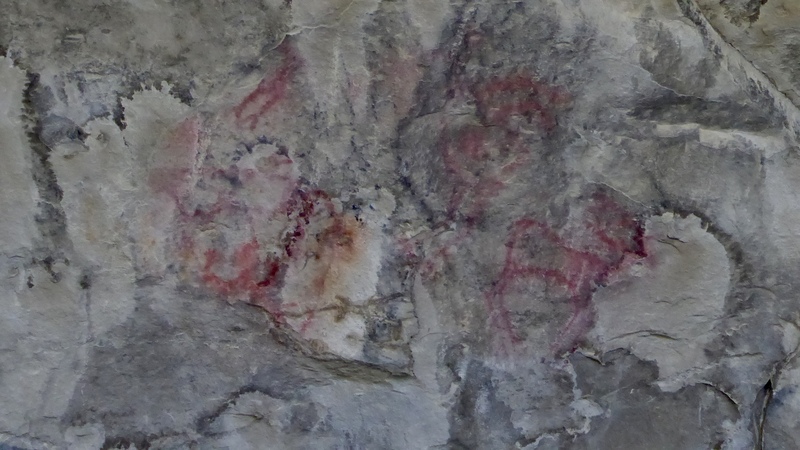 Pictographs are visible within the cave. 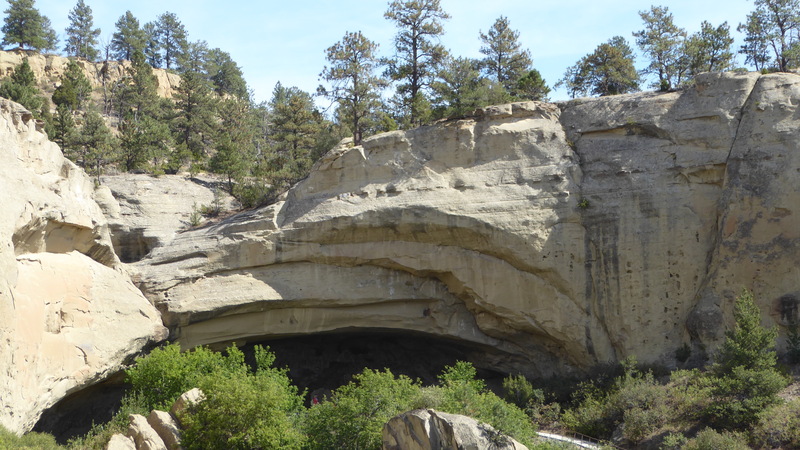 (Pictographs are painted on stone surfaces as opposed to petroglyphs which are carved.) A unique feature of this cave is that the number of pictographs visible vary based on the moisture in the cave. 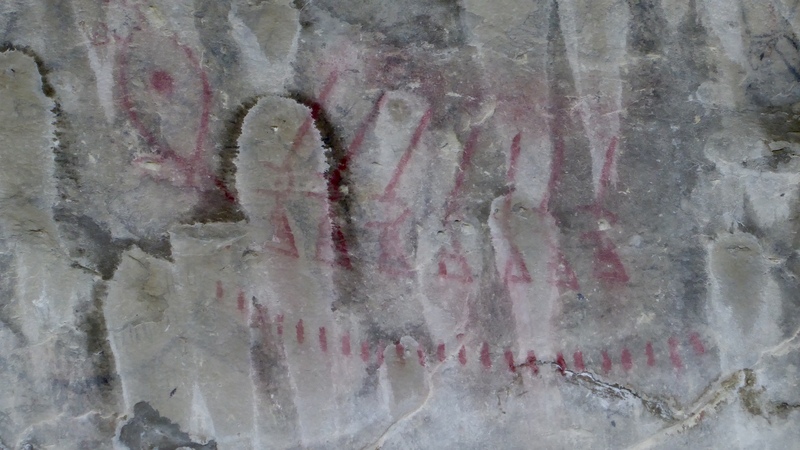 The pictographs visible on the day we were there were red – painted with the mineral hematite – either with a finger or a stick. A paint applicator found at the site radio carbon dated back to 1480 – 1650. This rifles pictograph was done within the last two hundred years and is just a few feet away from some done 1000 years before..
Black, charcoal pictographs, which were not visible, date back to approximately 250 BC. Many of the pictographs have been lost over time to environmental issues and shifting/cracking of the cave walls. Better get here quick if you want to see them! We stopped so Randy could play a quick 9 holes on a city park disc golf course. Elko and I stayed in the truck since the signs said dogs were not allowed. Then I watched person after person walk their dogs on the course in the park. When a policeman came by, I asked about it. He said if the dogs are leashed and not causing problems, they don’t enforce it. Interesting…. A stop at Albertsons and Costco was necessary to restock our food supply! 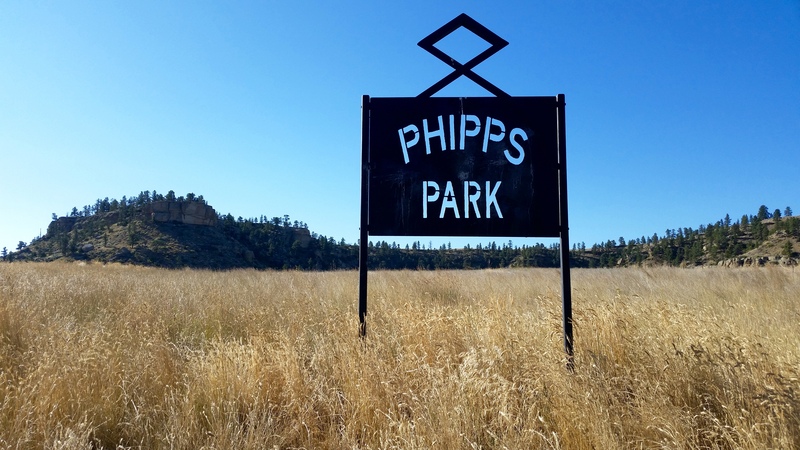 After that we headed the 35 miles (50 minutes) back to Chief Plenty Coups State Park. 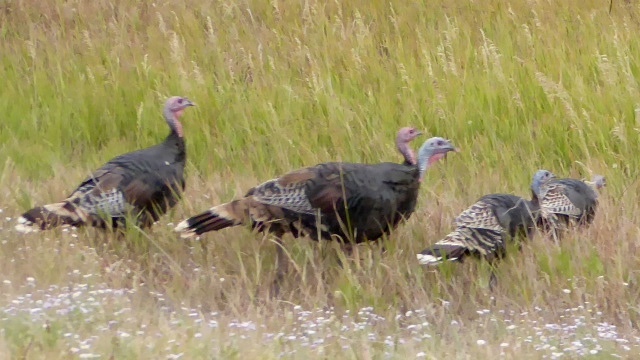 First we saw wild turkeys! 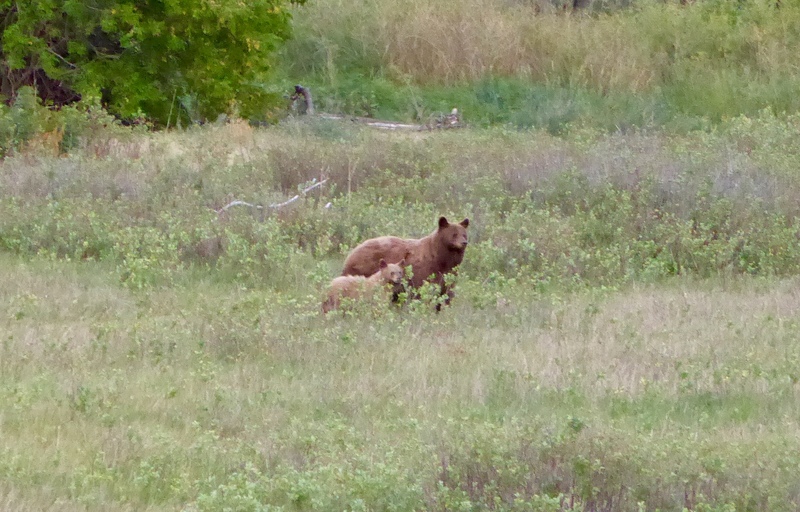 Then we say a mama bear and cub. We wondered at first if these were grizzly because of their coloring but comparing humps and other things, we believe they were (brown) black bears. 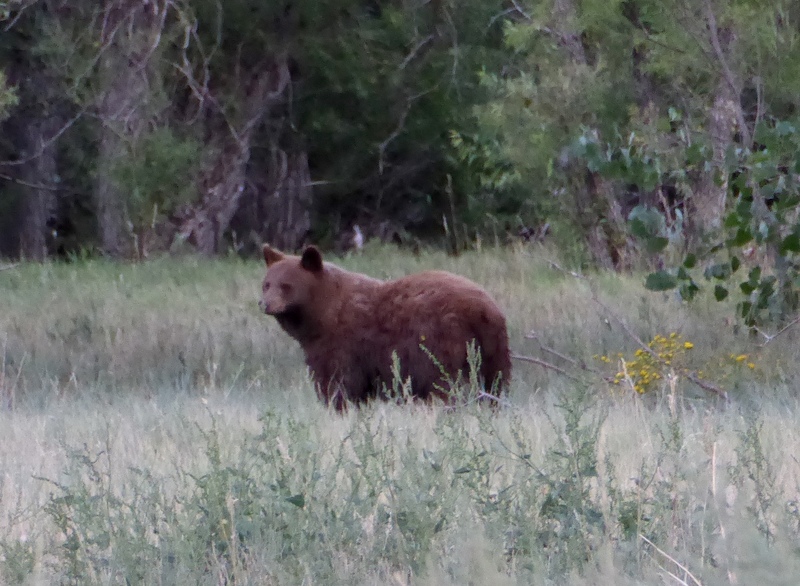 We don’t see bears in the wild very often so we were very pleased! We watched them for about 5 -10 minutes. 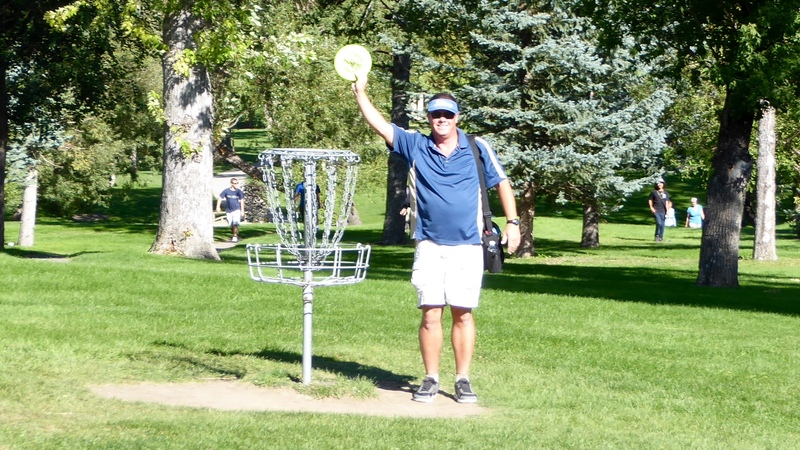 Randy set off to play the Diamond X Disc Golf Course at Phipps Park in Billings – Everything is back in Billings :). 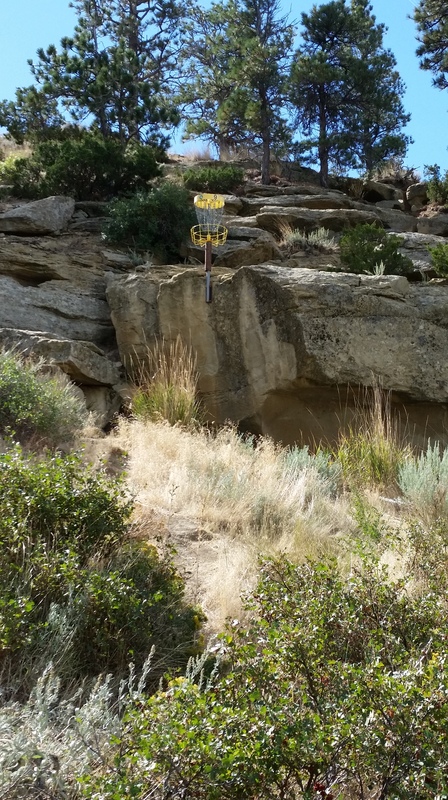 According to his disc golf buddy, Mark, this is a destination course and people come from all over the country to play. Described as 1/3 climbing, 1/3 hiking and 1/3 disc golf, it sounded intimidating, but a “must do” if you are in the neighborhood. Elko and I opted to stay home and clean the trailer which needed it after 13 straight days of working. Once we saw his pictures, I knew that had been a good choice. 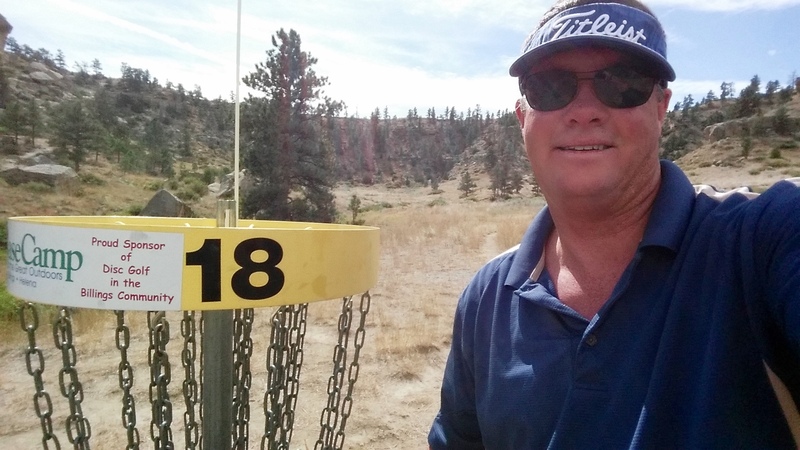 As a beginner on a very difficult course, Randy was satisfied with his round. He found two discs and didn’t lose any of his so he was +24 in shots and +2 in discs. Once Randy got home, he had to put his handyman hat on. Our toilet pedal had broken a few days earlier and he had bungy-corded it together. 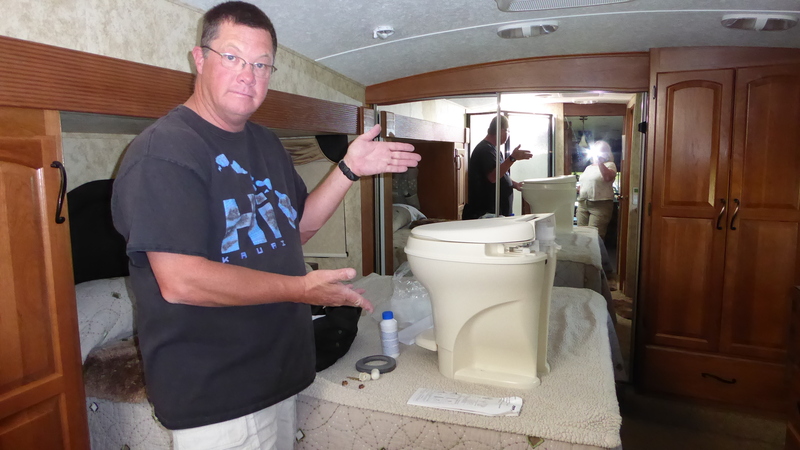 Thanks to Amazon Prime, we had a new toilet within a few days. It did take one more trip into Billings to get an adaptor part. 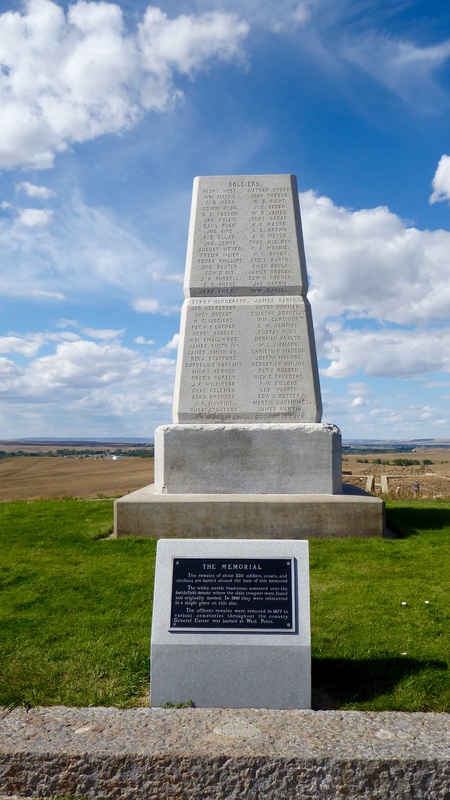 We headed out one direction and found 17 miles of dirt/gravel road ahead of us so turned around and drove west to east through the Crow Indian Reservation to Little Bighorn Battlefield National Monument. National Parks and National Monuments are not “paw” friendly at all and if we had planned to go there when we left home, we might have left Elko behind. As it turned out, our visit was interesting but incomplete. (Elko is worth it!) It will stay on our to-do list for a more extensive visit at another time. 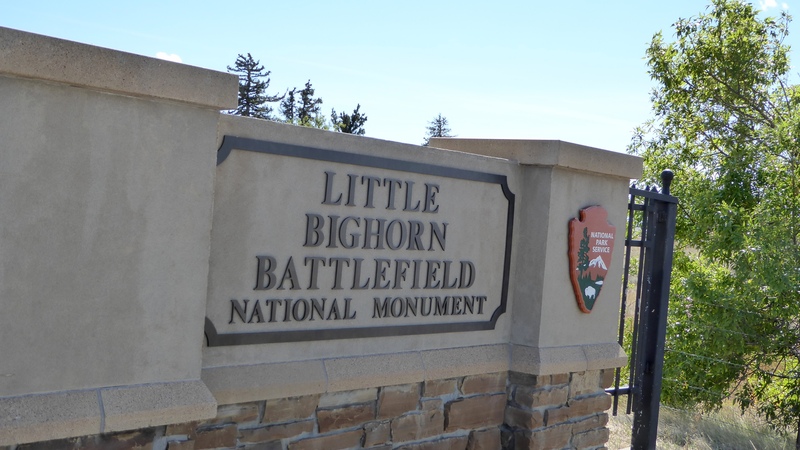 The Battle of Little Bighorn took place on June 25, 1876. The battlefield was on the Crow Indian Reservation (about 200 fought with Custer) but the 7th Calvary’s battle was against vastly greater numbers of Lakota and Cheyenne warriors. The 7th Calvary lost 210 men. There were some civilian casualties as well. 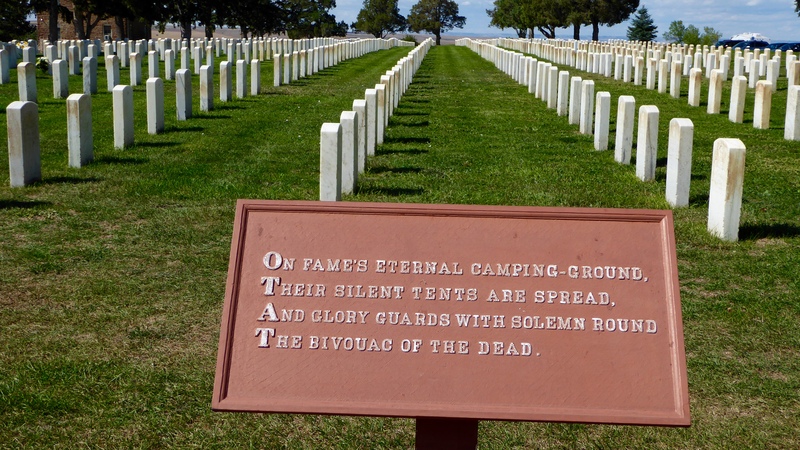 Soldiers who fell were buried in shallow graves on June 28, 1876 and marked with white crosses. In 1877 officer remains and those of two civilians were transferred to eastern cemeteries. 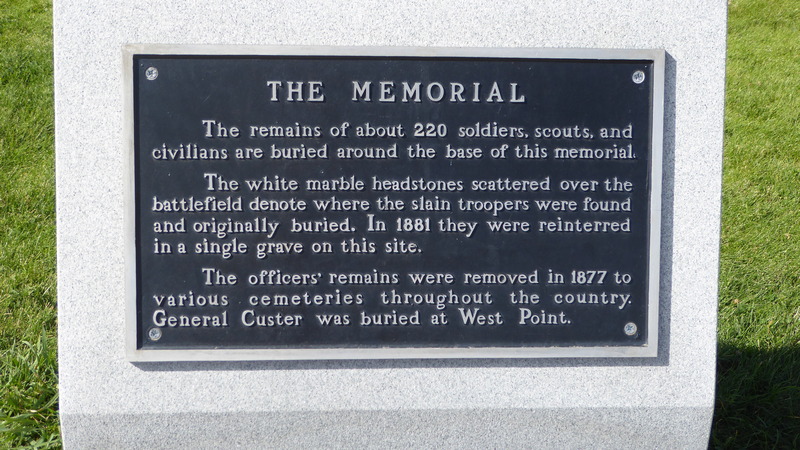 Custer’s remains were reinterred at West Point. In 1881, remains of soldiers were collected and placed in a mass grave at Last Stand Hill around the base of the Memorial shaft bearing the names of soldiers, scouts and civilians. 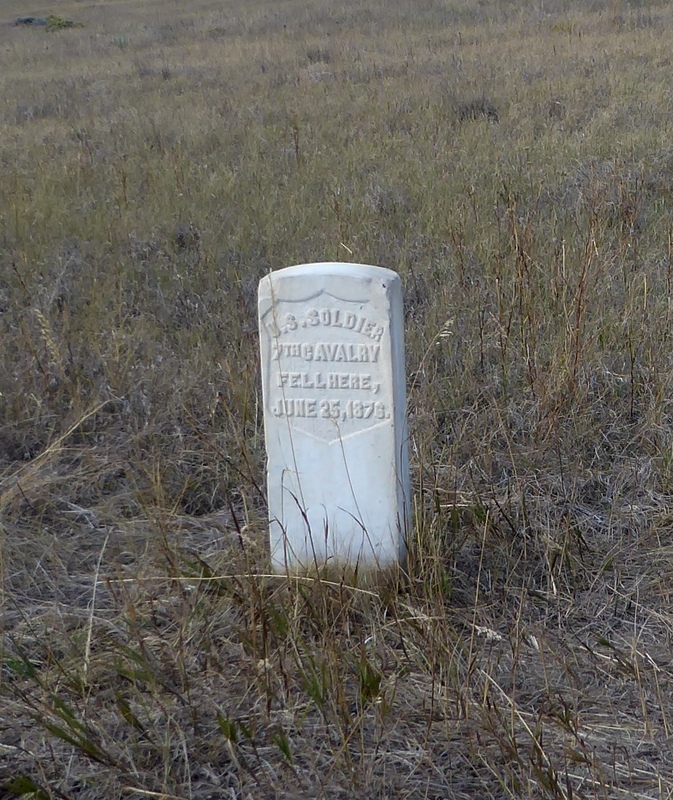 In 1890, 249 white gravestone markers were placed all around the extensive battlefield to show where the 7th calvary soldiers fell. There are about 45 on Last Stand Hill. George Armstrong Custer’s marker is the dark one. Indian casualties were removed from the battle field by their tribes so it is is unknown exactly how many died. Estimates are 60 – 100. 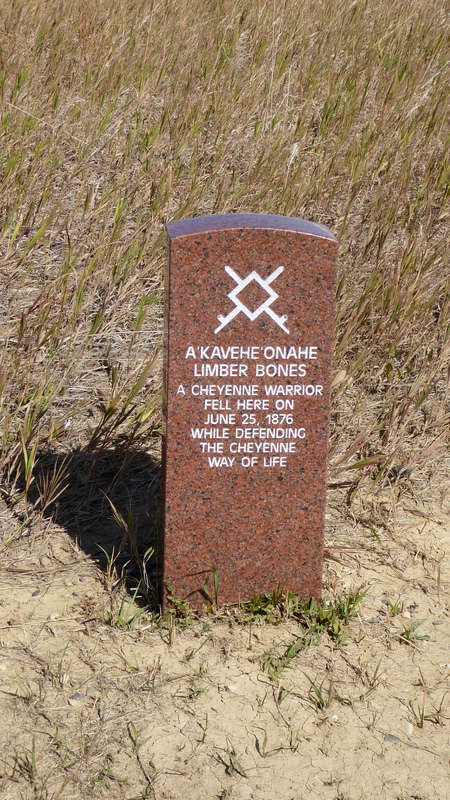 In 1999 the Park Service began placing red granite markers at known Cheyenne and Lakota warrior casualty sites. 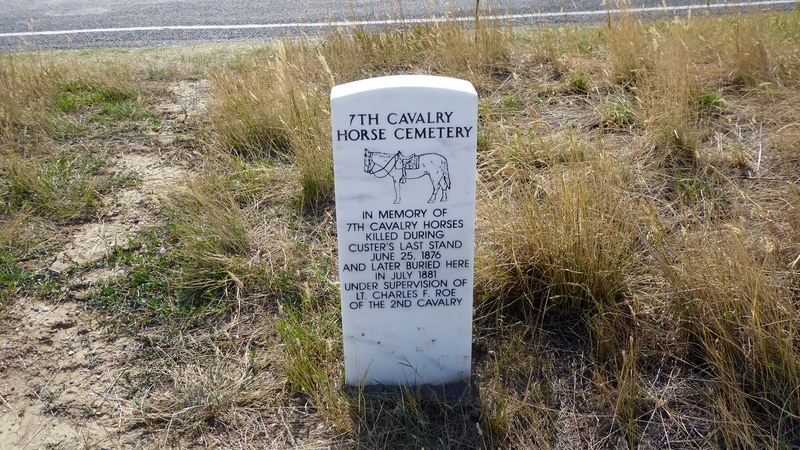 There is even a memorial to the many horses that died in the Battle of Little Bighorn. 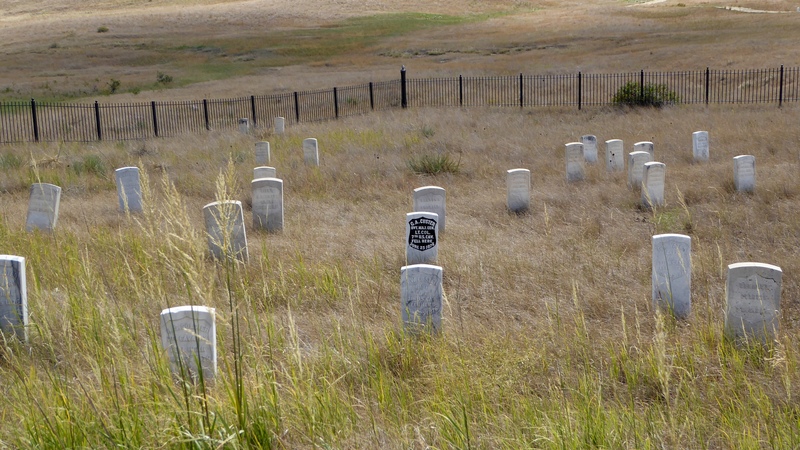 Also on the grounds is the Custer National Cemetery. 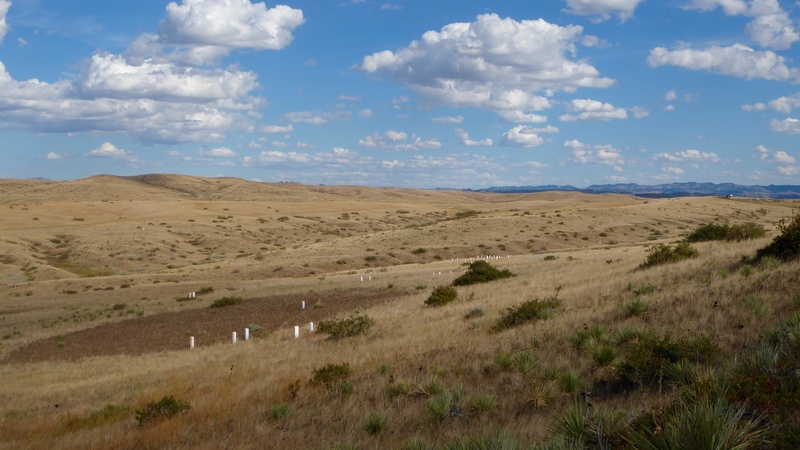 The original cemetery was for those who had been buried at western outposts, since abandoned. The dead were moved to this site. Over time veterans and spouses from World Wars I and II, Korea and Vietnam were buried at this National Cemetery. There are 5000 sites, only about 50 (which are reserved) are left to be occupied. Phew!! You guys covered a lot of ground on your days off. Those are great bear pictures. I agree that they are of a (brown) black bear. Whitetail Campground here has had a bear getting into their dumpster, so they are getting bolder!! Now that Randy is into DG, you’ll find you get to stop at all sorts of out-of-the-way places!! We enjoyed all the “out of the way places” when we were geocaching a lot. If disc golf gets us there, that is fine too! Randy seems to be really enjoying it. Hopefully they get Whitetail closed for the season before the bear gets into too much trouble. We are confused. You were hauling your trailer on a day off? Or now even your truck can’t go on gravel roads? :>) Great shots of the bears. And looking forward to hearing about your volunteering experiences. Ha-ha – You know us. Trailer stayed put but the truck did end up going on the gravel road yesterday. The miles on the reservation were marginal but the “Montana” miles were okay. We even had some rain to keep the dust down. Looking forward to hanging out!